What would the Grand Canyon be without sunsets? I think the one on Sunday (appropriately) was above and beyond the ordinary. All of the action really seemed to be happening to the east. 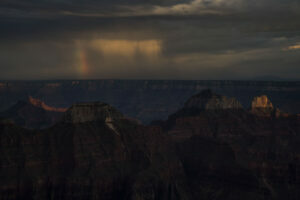 A heavy rainstorm could be seen with a short rainbow just to the left of the rain. As the sun descended, the sheets of rain were brightly illuminated as the rainbow persisted. Light on the tops of the rock formations in the canyon receded into shadow. I found it extraordinary to see this combination of weather and light. And all the while we on the Bright Angel Point were dry under pleasant evening sky. My impression of Ansel Adams. 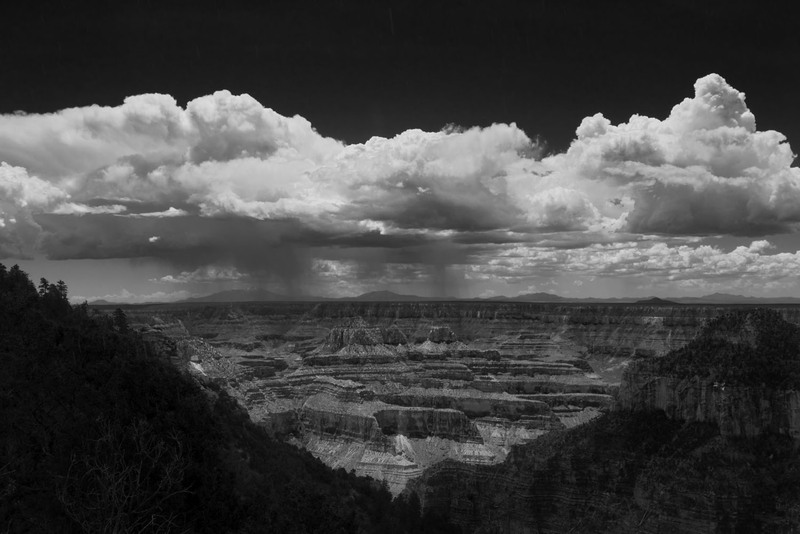 Here’s another storm over the canyon taken Sunday from the Transept Trail that goes from the cabin to the Grand Lodge. Like the previous popular post, this looked more dramatic in black and white. 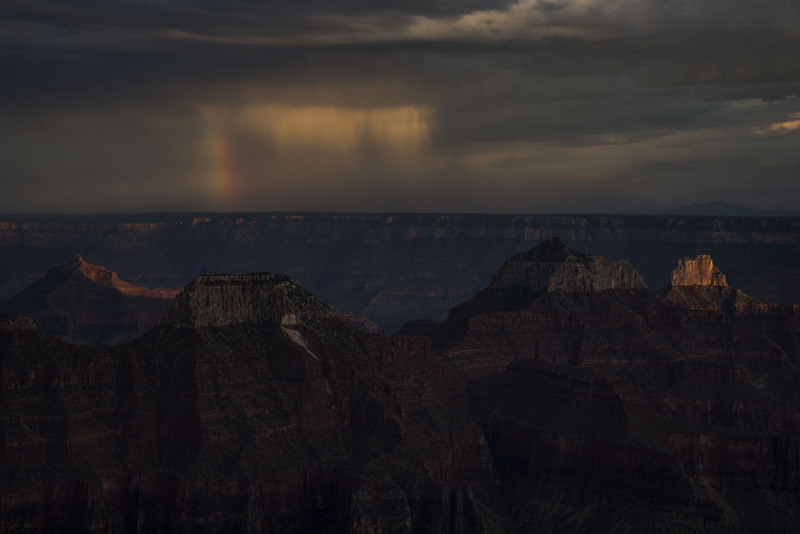 While it stormed in the distance, the center of the canyon was in bright sun and it was raining over me. I think Ansel Adams and others do a much better job at these landscapes, but I can see why they worked so much in the west. 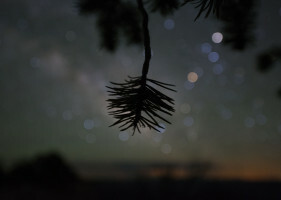 Pine needles and Milky Way. The pattern of almost total overcast, followed by clear and tranquil skies continued last night. I concentrated on more of the plant photos, which I’m beginning to enjoy. Oddly enough, for a photographer, I like the out of focus sky. Generally for the night sky pictures I try to make the stars and especially the Milky Way as sharp as possible. But focusing closely on a subject gives an impressionistic feel to the background. The astronomically inclined will see Scorpius with its curving tail to the right and a bright Saturn above the three stars that make up Scorpius’ head. Which means the Milky Way is directly behind the pine needles flowing off to the left, Sagittarius below it. Even the dark lanes of the galaxy are recognizable.